£1,320 for pupils in reception to year 6. The school is required to utilise this funding to improve the outcomes for these pupils. The school is also required to publish the way in which the pupil premium funding is spent each year. Please click on the links below for the a narrative report and expenditure reports detailing how our school has used this money. To achieve effective immersion, dedicated classes have been established (2 in KS2 and 1 in KS1) whereby children with little or no English receive intensive language provision in order to rapidly secure the skills with which they can access the national curriculum. The school has invested in training for teachers that promote accelerated language development (Communicate in Print, Makaton and Stories for Talking) and this is proving to be particularly effective. We see every lesson as a language lesson and promote the use of sentence openers to be used in every lesson and on display at all times. Extended leave is never authorised during term time and attendance panels take place when a child reaches a trigger. Action plans are also put in place to ensure attendance is improved. Incentives are used on a regular basis for children having 100% attendance each week, term and year. At the lower school, termly trips for children with 100% attendance were introduced as an additional incentive for children to attend school. A whole school attendance board was established at the lower school where children are aiming to reach their target in order to receive additional prizes. This was also being supported by individual attendance passports. Targeted support for all children is delivered based on the findings of robust pupil progress meetings which take place throughout the year. Teachers provide ‘additional and different’ support which takes place outside of classroom directed time to enable them to reach their targets. These are reviewed on a termly basis to ensure maximum impact. In addition to this, the Y2 and Y6 timetable has been extended (8:10 – 4:30pm) to ensure every child has as much support as necessary to maximise their achievement. At Lower Meadows, the introduction of reciprocal reading in Year 1 and 2, Rainbow reading and talk for writing has also had a positive impact on narrowing the gap. The school’s extra-curricular activities programme is comprehensive and includes diverse and unique opportunities such as Judo, Latin, Cooking, Arabic and Samba. The school provides a nutritious breakfast for every child every day which is funded by Greggs Ltd. Children are also provided with food and clothing which is funded through donations and fundraising events. Questionnaires have been completed to ensure that parental and children’s views influence what we provide. The senior leadership team scrutinise and monitor all provisions in school closely. This is through formal observations, drop in’s, scrutiny of attendance at clubs, tracking, books and planning. Robust pupil progress meetings and action plans allow for regular scrutiny of interventions and additional and extra support that is being provided. This is then reviewed to ensure that what is being provided meets the needs of children. All teachers are confident to be able to reflect on the ‘additional and extra’ being provided and any interventions the child receives and will come and discuss provision before pupil progress meetings, which enables children’s needs to be met at all times. The school data shows significant improvements in the attainment of disadvantaged pupils over the last three years (see page 29 of the full report below). Tinsley Meadows is a reflective school that is constantly reviewing practice within school and researching new initiatives to ensure that children can maximise their progress. With this in mind, the school has engaged in the ‘Visible Learning’ approach, which focuses on John Hattie’s research and principles. The children at Tinsley are also engaged with the Education Endowment Foundation funded Metacognition Project; ‘ReflectEd’ with Rosendale Primary School in Lambeth and are working with ‘Third Space Learning’ maths tutors in India. 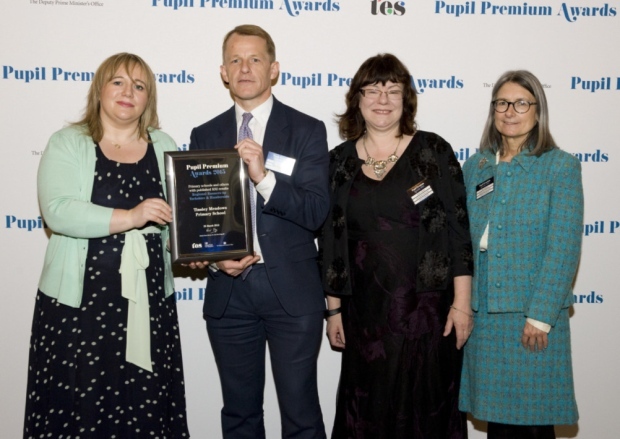 As we recently won Regional Runner Up in the 2015 National Pupil Premium Awards, we have been encouraged to become a Pupil Premium Reviewer. This will mean that we can support other school leaders more robustly through a peer review process. If you would like to learn more about our strategies for success or would like us to conduct a review in your school, please do not hesitate to contact us.